The Mother Church college network is designed to help you connect with other Christian Scientists on your campus as well as other campuses. Search through the directory below to explore the network. If this is the first time you’ve heard about our College Network, please sign up here. 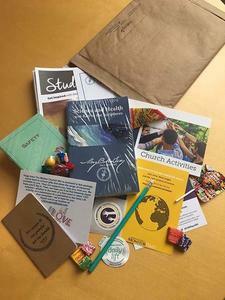 If you’re a student who joins before September 1, 2018, you’ll receive a care package similar to the one pictured here! We welcome faculty, staff, instructors, alumni, participation, but only active students are eligible for the care package. Looking for and seeing what God is doing on your campus and in your community is a big way to help your school. The purpose of this network, as pointed out in this Christian Science Monitor article, is helpfulness—help for ourselves and for others. If you have any questions, please contact us at CSOsupport@csps.com. We’re here to help! *Note about the “Type” column below: ESTABLISHED means that a CSO is recognized by the school. FORMING means that CSO is present, but as an informal group. CONTACT means that a member of the college network is on campus but there is no formal CSO activity.